Posted on October 26, 2016 October 26, 2016 , in Swim Spas. When you want the best possible swim spa for your lifestyle, it’s crucial to choose a manufacturer that creates products that will meets your needs. Reputation, maintenance, and versatility are just a few of the considerations you should make before deciding which manufacturer to buy from. Below, you’ll learn about Hydropool, one of the top swim spa manufacturers in the world. Choosing a reputable swim spa manufacturer is essential to ensuring that your needs are met. A good way to determine the reputation of a company is to do some online research. For starters, read consumer reviews to find out what customers’ experiences with the company have been like. Also check to see how long the company has been in business, as this is a good indication of a manufacturer’s quality. For example, Hydropool is one of the oldest swim spa manufacturers in the world with over 35 years in business and over 20 years producing top-quality swim spas. Visiting the dealer is another smart way to find out about a manufacturer’s reputation. Although choosing an energy efficient swim spa is one of the best ways consumers can save money, different manufacturers have different commitments to energy efficiency. Hydropool swim spas are known as some of the most efficient in the world because they have the capability to filter all of the swim spa’s water in only 40 minutes. This is a huge difference from competitors’ models, which can take 6-8 hours to filter all of their water. Hydropool also invests in Thermal Shield technology, advanced insulation that allows the swim spa to reuse its own waste heat. This will provide you with even more in energy savings. When choosing a swim spa, you want to know you’ll get the smoothest swim possible. Not every manufacturer can provide you with this, but Hydropool has been making innovations for two decades to perfect their swim. By implementing balanced hydraulics and high water volume, you’ll always swim in a deep, wide, and spacious channel where you can easily and comfortably swim using every style of swim stroke. Hydropool also achieves a smoother swim through its patented Swim Fin technology. This cutting-edge advancement diminishes turbulence by literally cutting the vortex as it emerges from the jets. Their shells are also engineered to get rid of backsplash that can create a choppy swim. Finally, Hydropool has implemented an adjustable current that lets user simultaneously adjust both swim jets to their individual needs. This is a huge improvement over competitors’ jets that don’t allow simultaneous adjustment and can be hard to control. The ability to quickly and easily conduct maintenance is a top priority for many people in the market for a swim spa. Hydropool swim spas offer self-cleaning technology that simplifies maintenance, saving you time and energy. Filtration jets that push debris into the skimmer prevent you from needing to skim. In addition, Hydropool swim spas use pre-filters to catch large debris while floor filtration jets move any heavy debris on the floor into the vacuum. This ensures that you’ll never have to spend time vacuuming your swim spa. Because Hydropool swim spas utilize an easy access filtration system that pushes water and debris rather than pulling it, the water can be filtered very quickly. Because Hydropool makes maintenance so simple, you’ll have plenty of time to spend doing the things you love. The best swim spas are versatile, allowing users to exercise as well as experience fun and relaxation. Hydropool swim spas are known for their high-level versatility, allowing you to participate in a wide range of options you can customize to your needs. From innovative rowing options to resistance tether running, post-workout massages, or boogie boarding for kids, Hydropool swim spas provide the versatility to make your whole family happy. To create the smoothest possible swim, proper pump design is essential. This is why Hydropool has designed their pumps to offer significant benefits over their competitors. Not only are pumps strategically positioned to maximize flow, but they’re located near the swim jets to ensure that the jets have superior power. A conveyor belt style pump system eliminates turbulence by pushing water from the jets toward the steps. High-tech jet systems are an essential part of creating a perfect swim. After many years of experimentation with advanced design and engineering efforts, Hydropool has created a jet system that is unmatched. Its Swim Fin System literally shreds the jet vortex, reducing turbulence and creating a perfectly flat swim. Whether you are a competitive swimmer or a beginning paddler, the ability to adjust speed and resistance as you improve is key to helping you meet your fitness and training goals. While competitors’ models require users to adjust each jet individually, Hydropool utilizes Aquaflex technology that allows water to be released simultaneously from two wide stream jets. The benefit of this design is that resistance can be created without adding unwanted turbulence. In addition, each user can adjust the speed and resistance so it perfectly fits their needs. Finally, Hydropool offers a wide range of swim spas designed for all levels of swimmers, from beginners to competitors. Although rectangular designs among swim spas are common, they can create a less than ideal swim. This is because they create excessive backsplash that makes for choppy water. In response to this, Hydropool has designed a shell that features outcrops. This eliminates backsplash and maximizes the smoothness of your swim. If you’re looking for an energy-efficient swim spa that costs just a few cents a day to run, Hydropool has the options you need. Their cutting-edge insulation makes these swim spas among the most energy efficient on the market. By utilizing Thermal Shield Technology, the hard cover catches any heat from the water’s surface and reuses it. In addition, the shell is insulated and the inner cabinet contains a Thermal Shield blanket, both of which trap and reuse motor heat. Hydropool also offers an advantage over competitors because of its thermal vent system. This system helps to regulate your swim spa’s temperature year-round by letting heat escape during hot weather and trapping it when the temperature dips. Comfort is key when you want to relax in your swim spa. Because they’re designed to spaciously accommodate several swimmers, Hydropool swim spas are known as some of the most comfortable available. Most Hydropool models feature at least two seats. Recessed jets ensure that you’ll be comfortable during your massage and there is a generous foot well so many people can sit without feeling cramped. 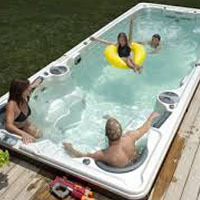 Hydropool swim spas also offer superior massage features. The jets are designed to provide equal and balanced water flow from each jet. Adjustable jets also allow you to massage the places on your body where you need the most relief. Thigh and glute jets are also in place to provide a targeted, individualized massage for large muscles. Hydropool provides some of the most trusted swim spa warranties available. These include long-term structural, parts and labor, and shell warranties that will protect your purchase for years to come. These extended warranties are not offered by Hydropool competitors and can save you substantial money on repair costs over the years. These are just a few of the innovations that set Hydropool swim spas apart from competitors’ models. To find out more about how you can choose the best swim spa for your needs, download our Swim Spa Buyer’s Guide.